The Pulaski Theatre presents McFadden and Friends, Magic Moments and Janet Longerbeam in concert on Saturday, January 12, 2019. Join us for a musical feast of Jazz, Blues, R&B and Pop music with McFadden & Friends, The Traditions and Janet Longerbeam featured on saxaphone. Help us celebrate Easter! 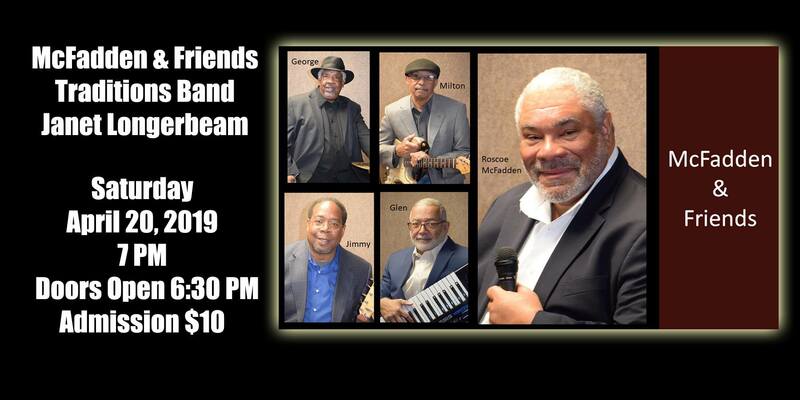 McFadden and Friends is a Southwest Virginia quartet performing blues, jazz and more that has come together after over 150 years of combined musical experience and paying their dues. The band is committed to quality and presentation. The Traditions based in Southwest Virginia formed in 2010 with brothers James and Isiah McClanahan, along with cousin Jerome Conner and lifelong friend Roscoe Young. Their love of music had been passed down through several generations, and the band became known for its jazzy performances of Motown and classic rhythm and blues. Doors open at 6:30 pm and the music starts at 7:00 pm. To view the event flyer, visit: https://i.imgur.com/PiUX9ox.jpg. For more information, visit: http://www.pulaskitheatre.org/ or https://www.facebook.com/pulaskitheatre or call 540-994-9555.